I've been planning to read the book ever since I've seen good reviews. Everyone says it is awesome, it makes them cry, and some I heart that it is better than The Fault in our Stars (it's a person's opinion). So I really wanted to read the book, but then months passed and I wasn't able to buy a book because I've been really busy with so many things. And then I got a new work and a new friend who is also a reader. She lend me her copy of the book. On that day, I plotted a weekend where I will just read the book and see for myself what everyone says about it and honestly? This book is a perfection. The way the book was written is really pretty. You'll love every character and hate some of them too. 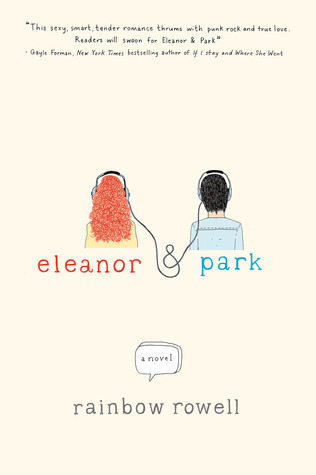 You even want to live inside the book just to see personally how Eleanor and Park will fight for their relationship. Their story will touch the reader's heart. The way every thing is started is really the typical teenage scene but in a one hundredth level because theirs is really cute. Park is really funny I swear, you will love him instantly. He is this kind of guy who hates to see people being bullied. He loves Eleanor so much and he is willing to do anything for her. He is the type of guy who wants every girls to be with. Eleanor, I can see her as a typical teenage girl, every person see her flaws, or just her flaws. She's always being bullied because of her size and the way she dressed. Park is a rich guy, while Eleanor is not a rich girl. They're the complete opposite of each other but they managed to work on their relationship. Readers could learn a lot from them honestly. This book is written simply, the story is so easy to understand but it is not boring. It will catch your attention and you will love it right then and there. When I was reading I seriously can't stop myself from turning the page until I reached the next chapter and until the end. I can't stop smiling, and my heart felt pain when things didn't turned out great. I enjoyed reading the whole book. This book should have a movie! Like... seriously it should have. It will be really awesome! I would never get tired of rereading the book. If I got another free time I will read it again. AND I'll make sure it is my own copy this time. Thank you to my friend who lend me her book! No regrets. It's awesome and I knew now why people likes the book so much.